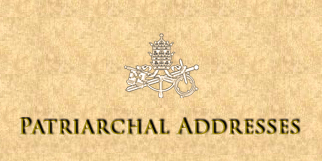 Patriarchal Addresses are formal speeches given five times a year at Christmas, Ash Wednesday, Easter, the Feast of Corpus Christi, and the Nativity of the Blessed Virgin Mary. The addresses discuss current topics of importance to the Church and the world. Patriarchal Addresses super numero are made as needed on special topics.